Many state borders are defined by a natural land feature or river like the Ohio River serving as the border between Kentucky and Ohio. Most borders and county boundaries are merely a defined geographic reference, without a physical or natural division. When we research it might be wise to ignore (or at least disregard) these boundaries where our ancestors' lived. The state line between Tennessee and Georgia is painted on the street in Copperhill, Tennessee and McCaysville, Georgia. Such signs between states in rural areas are the exception, rather than the norm. For example, when I visit my brother's farm in northern Robertson County, Tennessee, we can easily drive north about a mile and cross into Todd County, Kentucky without noticing we have entered another state. Since researching along the borders all my life, I realized that many citizens also ignored these borders when filing their records. In reality, almost all individuals when moving are jumping the boundary to a new area. 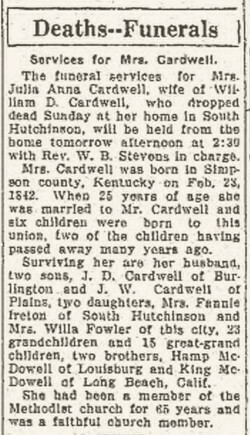 Consider the obituary of Mrs. Julia Cardwell. She died in South Hutchison, Kansas, but was born in Simpson County, Kentucky. Hutchinson News, Hutchison, Kansas, 1 September 1925, p. 3 col 5. Downloaded from Archives.com. 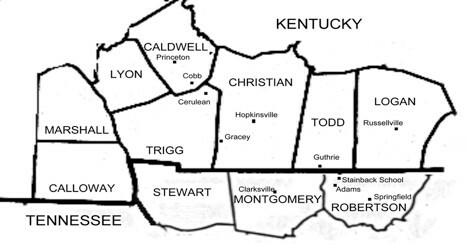 Mrs. Cardwell was born in one county and state, but moved to another before her death. This is a larger migration and would require more intense research. Border jumpers are more likely living in an area without restrictive natural boundaries, and where movement is accepted and normal. Finding families across borders is not a mystery. A basic understanding of the available records and the culture of the area will improve any researcher's opportunity for success. An effective border jumping family research plan will be creative and look for records that vary from county-to-county and state-to-state. Depending on the type of transportation available, this may range from a radius of 25-125 miles. 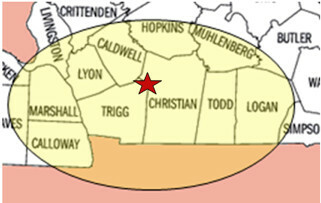 This map shows the counties included and the boundaries crossed in our focus. Once the area has been determined, add towns, roads and rivers. Our focus will include available transportation and other nearby communities. Begin to consider the areas where records might be found. Locate contemporary maps that cover the focus area. These maps now highlight the available roads or rails that traversed the area. We can now identify the communities where events occurred and recognize those places found in related records. These are widely available from online sources, but consider the Historic Soil Survey Maps at the University of Alabama or the variety of maps at David Rumsey. Consider all the known details. We always work from the known to the unknown. Begin to understand more about this person than a name. We might the same name across the border, and must know whether we are dealing with one or five individuals. Learn about records, boundaries, individuals, churches and more. When a border is nearby, we should learn about all the record types in both jurisdictions. Were there record types that might be recorded in both location? What are the laws regarding the registration of land, marriage, and estates? Some records are more likely to be found across borders. As the boundaries of early counties were changed or resurveyed, tax lists often placed individuals in a different district or county. An individual's tax location might change year-by-year. If the individual was avoiding paying the tax, he might even claim to be across the border. Although the marriage law of many states indicated the license should be obtained in the residence county of the bride, these laws were not usually enforced. A bride and groom might cross county or state lines to marry and return to their home area in the same day. My paternal grandparents, Earnest Lowe and Eunice Martin lived in Bowling Green, Warren County, Kentucky. They rode the train down to Mitchellville, Tennessee in Sumner County, obtained their marriage license and were married by F.M. Groves, a Justice of the Peace. They returned to Bowling Green later the same day. Marriage Book 13, p 241, Sumner County, Tennessee. Image available on Archives.com. Review the records of the adjacent jurisdiction even when you find the records for an event in the home jurisdiction. Look at available records by using the FamilySearch Catalog (https://familysearch.org/catalog-search) or record lists at the respective State Archives. Compare the types of records and review those that might provide more information on your border jumping family. Consider an additional recording of the same event. Perhaps the local church, where the bride grew up, made a record of her marriage, when the event occurred in an adjacent county. Records are created for individuals where they happen, not necessarily where they live. Espin Dola Williams was born in Robertson County, Tennessee, grew up in Missouri, and moved back to Simpson County, Kentucky. He operated a store and lived on the Kentucky-Tennessee state line. When he died, a Kentucky death certificate was created. If he had been south of the border when he died, a Tennessee death certificate would have been created instead. We rarely drag a body back to their home county when they die. Remember, however, that the estate of this person should be probated in their county of residence. 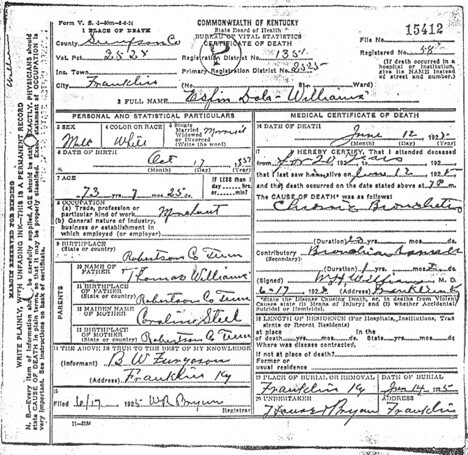 Espin Dola Williams, Kentucky Death Certificate, Simpson County, certificate 15412. Image available on Archives.com. Become familiar with all boundary changes in the area. Discover individuals and families who appear in both jurisdictions. Read the county histories for all adjacent jurisdictions noting families that appear in multiple places. Locate contemporary maps for a clearer understanding of the area. Learn what connects these locations and why folks might move easily. Build a solid profile of the individuals you wish to find. This must include what is known with reasonable citations.